1. Group Portrait at Ballengee Street, Hinton W. Va.
Group Portrait at Ballengee Street, Hinton W. Va. 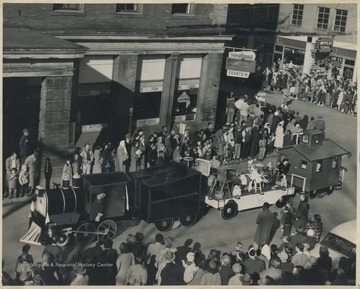 Unidentified group of men and boys lined up, facing the camera, on Ballengee Street. 2. 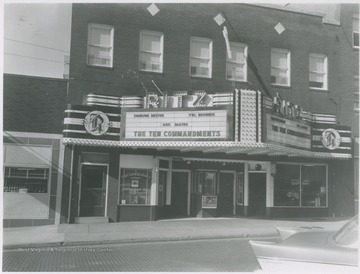 Ritz Theatre, Hinton, W. Va.
Ritz Theatre, Hinton, W. Va. 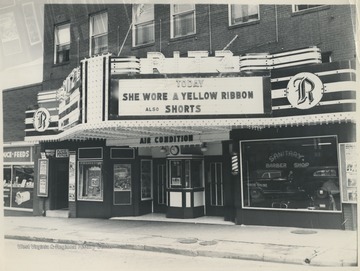 The building, located on Ballengee Street, is advertising "She Wore a Yellow Ribbon" playing that day. 3. In Front of the Ritz Theatre, Hinton, W. Va. 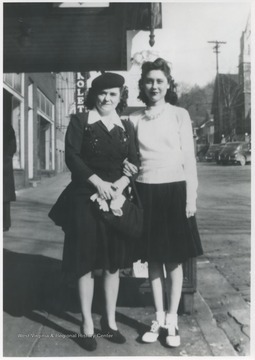 In Front of the Ritz Theatre, Hinton, W. Va.
Lona Richmond, left, and Betty Jane Arrington Angell, right, pose in front of the theatre on Ballengee Street. 4. Basil Petrey, Hinton, W. Va. 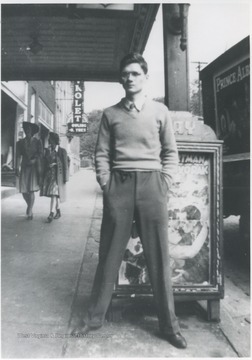 Basil Petrey, Hinton, W. Va.
Petrey pictured in front of the Ritz Theatre on Ballengee Street. 5. Ritz Theatre, Hinton, W. Va.
Street view of the building located on Ballengee Street. The theatre is advertising The Ten Commandments. 6. 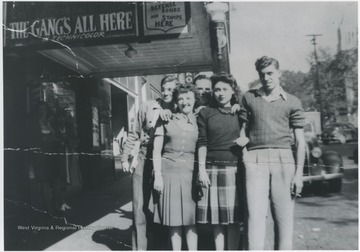 Group Posing In Front of Ritz Theatre, Hinton, W. Va.
Group Posing In Front of Ritz Theatre, Hinton, W. Va.
Pictured from left to right in the front is Earnett Cobb, Betty Jane Arrington Angell, and Lloyd Seldomridge. The two gentleman in the back are Homer Thrall, left, and Raymond W. Argabright. On the awning, above the group, reads, "The Gang's All Here". 7. 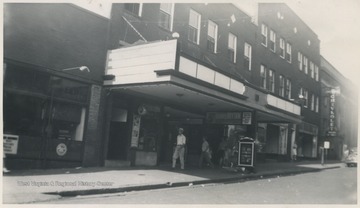 Ritz Theatre, Hinton, W. Va.
Street view of the building located on Ballengee Street. 8. Christmas Parade, Hinton, W. Va.
Christmas Parade, Hinton, W. Va.
A crowd gathers on the sidewalks as a float in the parade travels through the corner of Ballengee Street and 2nd Avenue. 9. 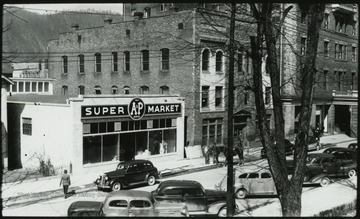 Ballengee Street, Hinton, W. Va.
Ballengee Street, Hinton, W. Va.
An unidentified man cross the street toward the super market. Parked cars line the sidewalk. The trees are bare, suggesting it is winter time. 10. 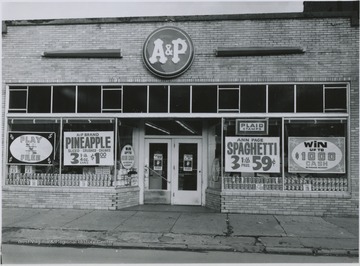 A &amp; P Store, Hinton, W. Va.
A &amp; P Store, Hinton, W. Va.
Street view of the store located on Ballengee Street. 11. First Methodist Episcopal Church, Hinton, W. Va.
First Methodist Episcopal Church, Hinton, W. Va. 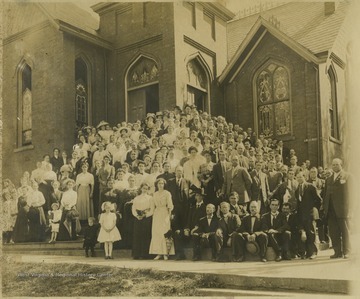 Located on the corner of 3rd Avenue and Ballengee Street, a group of church members pose in front of the building and on the steps. The reverend at the time the picture was taken was Rev. Gates. Subjects unidentified. 12. 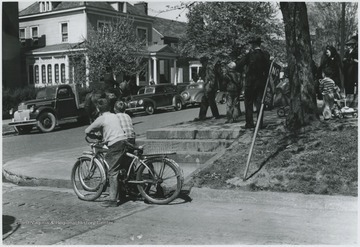 Re-enactment of Methodist Preacher Circuit Rider, Hinton, W. Va.
Re-enactment of Methodist Preacher Circuit Rider, Hinton, W. Va.
Two young boys on bicycles watch Moorman Parker perform the re-enactment on a horse in front of the First Methodist Church building located on the corner of Ballengee Street and Third Avenue.